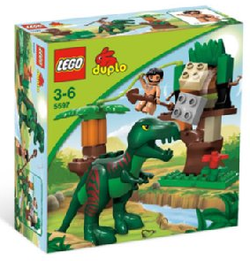 5597 Dino Trap is a DUPLO Dino set released in 2008. The set includes 28 pieces which consists of a dinosaur, a Cave Man DUPLO Figure, and various other DUPLO elements. This is a description taken from LEGO.com. Please do not modify it. Look out for the T-Rex! Uh-oh – a T-Rex is on its way! But the brave caveman is waiting to trap it by tipping rocks on its head. Can you help the caveman catch the dinosaur? Includes T-Rex dinosaur, caveman figure, tree, vine and other jungle elements! T-Rex's mouth opens and closes! Tree has a tipping function to drop rocks! Attach the caveman to the dinosaur's back! Facts about "5597 Dino Trap"
Look out for the T-Rex! This page was last edited on 29 April 2016, at 16:36.